Bjarke Ingels Group has announced the official opening of the long-awaited 79&Park, a residential development with a striking, stepped design. 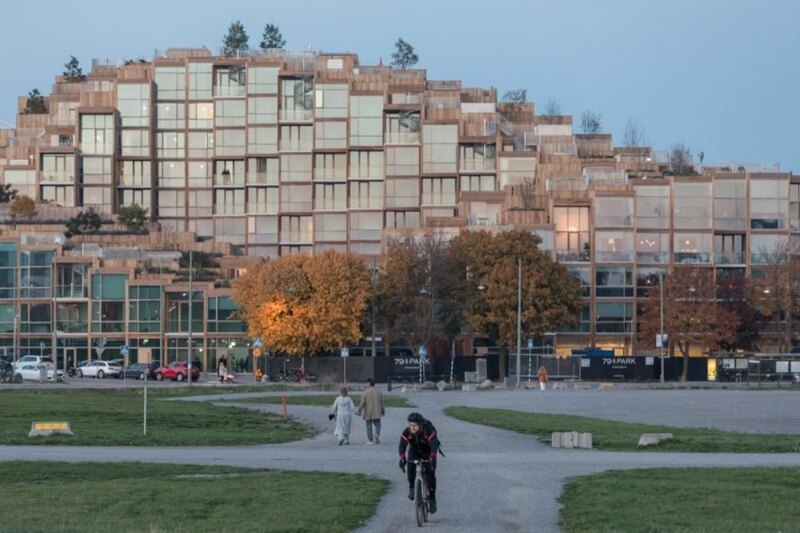 Located in Stockholm’s Gärdet district, the sculptural complex consists of 169 foliage-covered apartments constructed from prefabricated 3.6-meter by 3.6-meter modules that are arranged around an open courtyard. 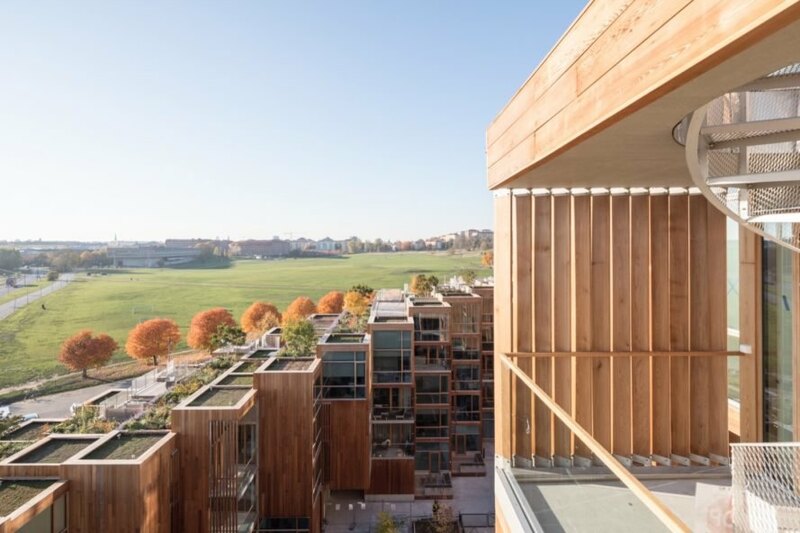 The cascading design was developed to optimize access to natural light as well as views toward the city and Gärdet’s parklands. Inaugurated on the same day as OMA’s Norra Tornen — another spectacular structure and the tallest new building in the city — 79&Park occupies a prominent location bordering the city park. 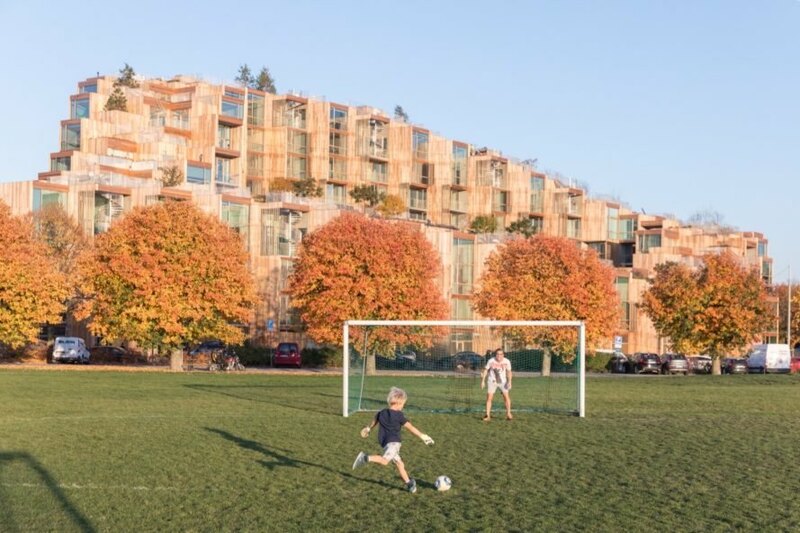 To tie the building into the urban fabric and adjacent nature, Bjarke Ingels Group crafted the building in the image of a gently sloping hillside and clad the exterior in vertical strips of cedar. An abundance of greenery has been incorporated as well, from the modular rooftop terraces to the lush central courtyard. In addition to the 169 apartment units — nearly all of them have a unique layout — the development also houses commercial spaces open to the public on the ground floor. 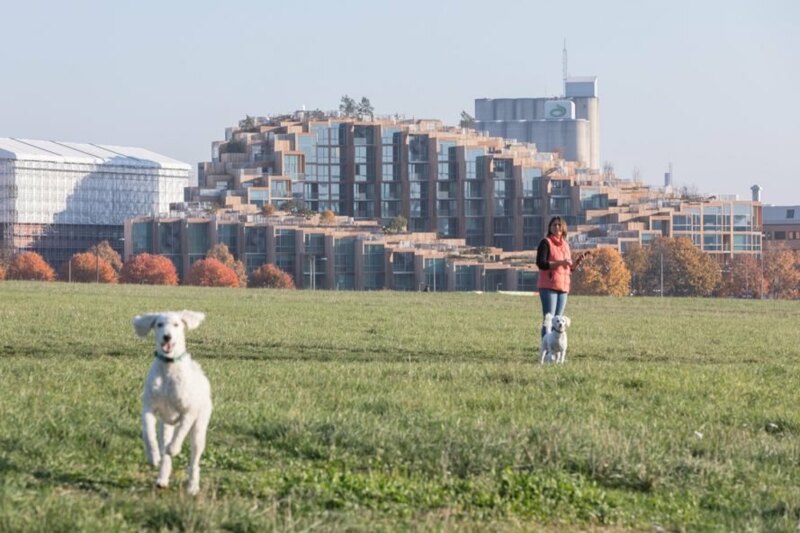 Resident amenities include a doggy daycare and preschool. Like the exterior, the Scandinavian design-inspired interiors were dressed in a natural material palette including white oak floors and natural stone. Large windows blur the boundary between the indoors and out. The highly anticipated 79&Park has officially opened in Stockholm. 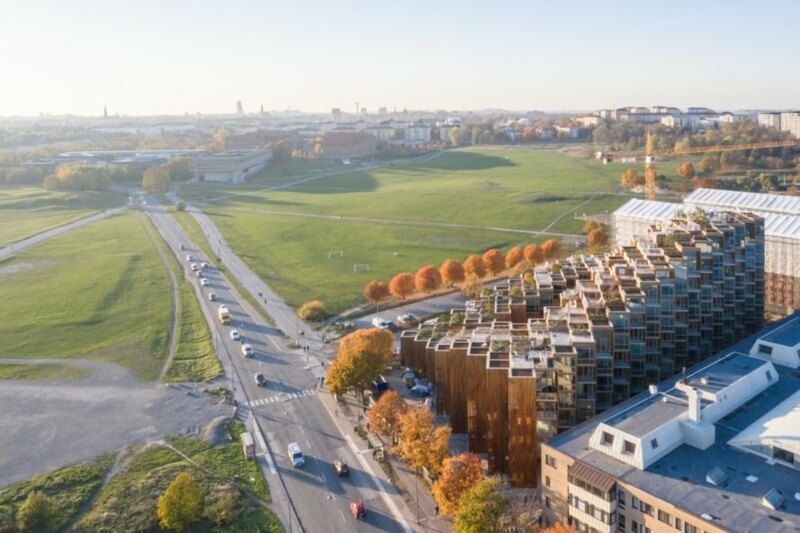 The apartments are designed by Bjarke Ingels Group. The housing development is located in the Gärdet district. 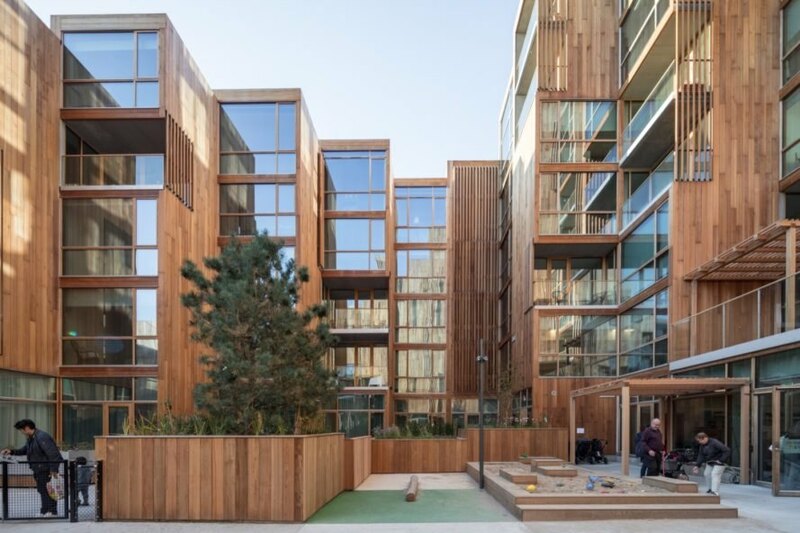 The stacked and staggered apartment units are formed around a central courtyard. The courtyard provides space for the residents to gather and socialize. The apartments are constructed from prefab 3.6 meter by 3.6 meter modules. A view toward the sky from the courtyard. The apartments are topped with lush green roofs. Rooftop terraces rest among the foliage. Colorful plantings make the building even more eye-catching. 79&Park sits on prime real estate near the city park. The exterior is clad in full-height glass and thin cedar planks. In addition to the residences on upper levels, the building houses retail spaces on the ground floor. Both inside and out, the design remains minimalist. The structure draws attention, even from a distance. The residents can enjoy the peaceful views and serene spaces within the building.